No one really remembers Sphinx and the Cursed Mummy, which makes it rather odd property to raise from dead. Originally released on the GameCube back in the early 2000s, it came out during the renaissance for action platformers, with the likes of Ratchet & Clank, Sly Cooper and Jak & Daxter cementing PS2 as the place to be. Add in the fact it was an original IP from a now-defunct developer that mostly worked on ports of other games or licensed tie-ins, and Sphinx and the Cursed Mummy, despite its quality, slowly sank through the sands of time and memory. But that’s just the thing. Developer Eurocom may have earned a name for itself by working on Harry Potter games or James Bond entries that ranged from decent to abysmal, but for a short time, it produced something genuinely great. Thankfully, THQ Nordic picked up the rights to this forgotten gem and now it’s been given a lick of HD paint and adjusted to fit the widescreen ratios of modern gaming. It’s still got some of its original faults – this isn’t a full remaster, after all – but it doesn’t take long to realise why Sphinx and the Cursed Mummy is such an underrated addition to a populous genre. As its title so cryptically conceals, you’ll be spending most of your time playing as Sphinx, a free-spirited demigod and... well, a mummy. When our deified hero is warned that the evil god Set is planning to plunge the world into darkness, he heads to the realm of mortals to foil his plans. Elsewhere, Prince Tutankhamen (yes, that Tutankhamen) has stumbled on a secret conspiracy headed up his older brother, Akhenaten, and is captured and forced into a black magic ritual. Sphinx arrives and interrupts the dodgy ceremony, but not before poor old Tut is turned into an undead monster and transported to Sphinx’s realm. With his thin body and long strides, Sphinx moves and controls a lot like Jak from the Jak & Daxter games, only with a little less bounce. You’ll start off with only a single jump and no means of protecting yourself (bar throwing rocks), but you’ll soon collect trinkets and tools as you go, including the rather useful Blade of Osiris, as well as the ability to double jump and brandish a handy shield. 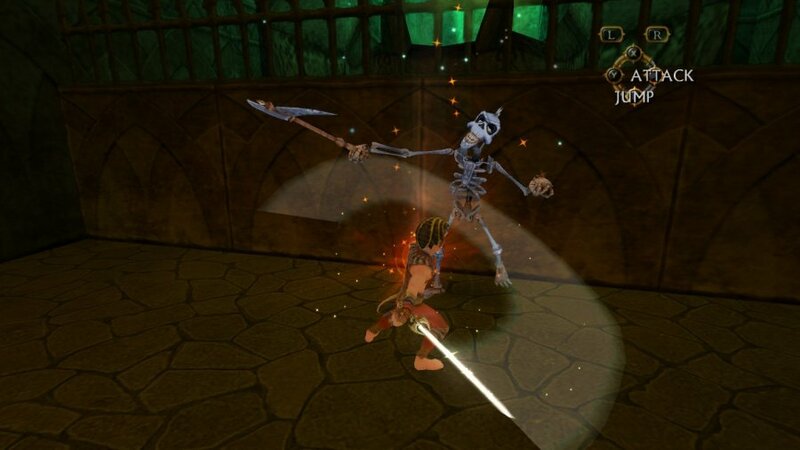 Rather than resigning Tut to being a carry-around sidekick (a la Daxter or Clank), the game gives the titular cursed mummy his own unique sections. 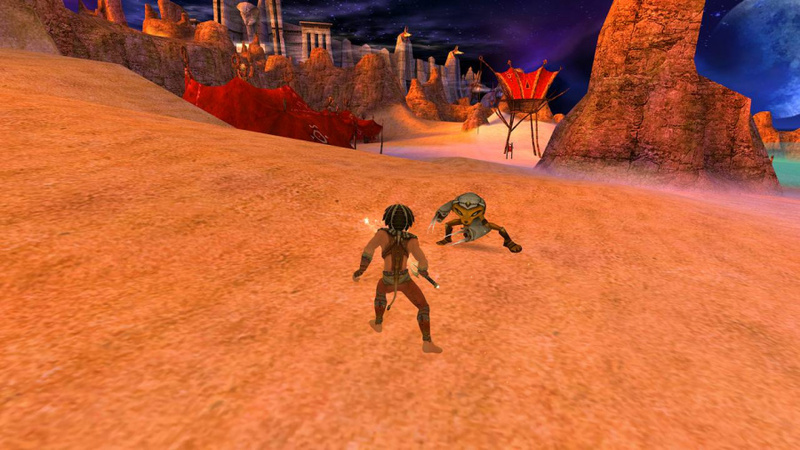 While Sphinx takes up a majority of the game with his emphasis on exploration, combat and platforming, Tut is more focused on stealth and puzzle solving. Since he’s technically dead, our mummified hero can take far more damage than Sphinx and can utilise special routes (such as sarcophagi that transport you to secret locations). The puzzles are still pretty obtuse, but in an age where everything is signposted and over-tutorialised, this is a characteristic from yesteryear that serves as a real positive for Sphinx and the Cursed Mummy's overall adventure. Matched with the impressive restoration applied to its visuals and you’re getting an action-platforming classic that suits Switch’s plethora of remastered hits to a tee. 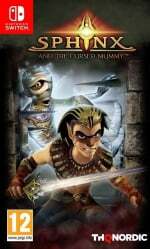 As is the case with many other HD remasters, Sphinx and the Cursed Mummy isn’t perfect and brings with it its own set of legacy issues. A dodgy camera – the bane of almost every 3D platformer – rears its ugly head here as well, too often getting stuck in the scenery or taking too long to right itself when transitioning from one level in an area to another. It can make platforming a little tricky at times, but considering how good Sphinx and the Cursed Mummy looks thanks to its HD lick of paint (it was a pretty decent looking game the first time around) and the smoothness of its performance on Switch, it’s a problem you’ll learn to live with if the genre means enough to you. The gaping distances between save points – another wonderful tactic from the 'old platformer playbook' – haven’t been addressed either. Not that we expected them to be, but without any form of autosave to rely on, it’s easy to lose 20-30 minutes of progress when you mistime a jump and plunge into lava, or get blown to smithereens by an exploding, two-legged goblin. It was a problem the first time around, and in an age of autosave saturation, newcomers might find this manual malarkey a bitter pill to swallow. While its platforming mechanics are still a tad unpredictable at times – and the huge gaps between save points still rankle – Sphinx and the Cursed Mummy’s quality nonetheless shines through. Weaving melee combat, environmental puzzles and plenty of platforms with a fun and interesting take on Egyptian mythology, it’s an action-platformer that really holds up well, despite the years on its clock. Its camera might still be a bit rubbish, but with a new lick of HD paint, this is a hidden gem that deserves a little time in the limelight. It's gonna have a bit of trouble competing with a certain other Action Adventure game that also comes out tomorrow. 100 times better then Breath of the Wild. So I guess you're saying BotW is 6/10 the most! @harrystein "100 times better then Breath of the Wild. So I guess you're saying BotW is 6/10 the most!" @harrystein This guy's comment history is pretty funny. I recommend it to everyone. As for this game, I never played it. I certainly remember seeing it on shelves, though it didn't strike me as particularly interesting. Even now it looks like a painfully average game. It's hard to justify picking this up with my current backlog. KH3 is nearly here, too. Loved this game the first time. Doubt I’ll replay it unless it hits 9.99 or something with a sale. Yes Super Mario Kart SNES is by far the best one. The original Zelda is the best one. Mario World is the best Mario game. Super Castlevania IV is the best one. This game is excellent. Hollow knight and BotW are overrated crap. It's called an opinion and my belief that people like these newer games is because they're children under 30. I don't remember this reviewing incredibly well. Still, I might check it out later on a discount. Enjoyed this one back in the day but never beat it. I'll pick it up at some point. Sparse save points are a bugbear of mine, doubt I can see past this issue. I wonder if they fixed the game ending bugs in this game? I played it on the Gamecube and had almost completed it when I saved and quit the game. When I booted it up the door to the next area would not open and there was no way to continue on. Mummy Door Glitch is what it's called. Looks like this game is going to be released physical for $30 (in my corner of the globe anyway). Compared to most new releases cashing in at $80, is pretty fair for a port of an old GC-era game, now in better resolution with widescreen support. Never played the original, although I saw it on the shelves at the time and remember seeing ads in magazines for it. Never struck me as original in any way, and I think reviews at the time reflected that, like, not bad, but spectacularly average. But I would give it a go at that price for sure. Seems that recently, I've been playing more games coming from this era, and sometimes, even average ones gives me plenty of fun for the money compared to many (overpriced) titles available on the Swtich's library. So I'll probably pick this one up later this week. @HeroponRiki I'm not up to date with all new releases, so which other action adventure game do you mean? As for this game, it is way to overpriced in switzerland so I will skip it. @jtmnm You're right, his comment history IS funny. I thought he was sarcastic at first but damn, this is just sad. I remember this. Was a fun little game, especially the mummy sections. Pretty sure it had a low RRP as well at the time which helped. Would have been cool to see what a bigger budget sequel could have been. I also remember this game, and will definitely be getting it on Switch, i'm loving THQ bringing back games like this, they make a refreshing change to all the open-world games of today, i've always preferred linear games. Huh. Never played this originally so I'll probably give it a shot this time around. This is $15 on Steam, and never cared to play it at home on PC. I can now not care to play it at home and on the GO on Switch for $30. I beat this on GameCube and it was... Fine. Nothing spectacular. Except I really loved the special challenge stages that were platforming heavy. Best parts of the game, easily. This looks just like old school Zelda. I just watched a full hour of gameplay NintendoEverything posted, and it really does look like Zelda through and through. The camera is a bit wonky, and the animations are dated. But the game looks incredibly fun. I'm interested. I'll eventually check it out after I sort financial issues. Hmmmm. This wasn’t very good on PS2 back in 2003 (I think?). I’ll give this one an enthusiastic swerve. "it’s easy to lose 20-30 minutes of progress when you mistime a jump and plunge into lava"
AAAAAANNNNDDDD... I'm out. This is absolutely unacceptable in 2019. If a game wants to be punishingly difficult, great. I'm all for it. But give me a respawn near the area that I'm getting beaten on. Being stingy on save points is an old-school design element that needs to be killed with fire. I bought a GameCube copy recently for £8. Better than paying $30 for a download only. It wasn't bad for brief period I played. I'll get to this once I have beaten Prince of Persia: The Sands of Time. This game is becoming somewhat of a cursed mummy itself, what with rising from the grave time and time again. It was a respectable game back in the day. 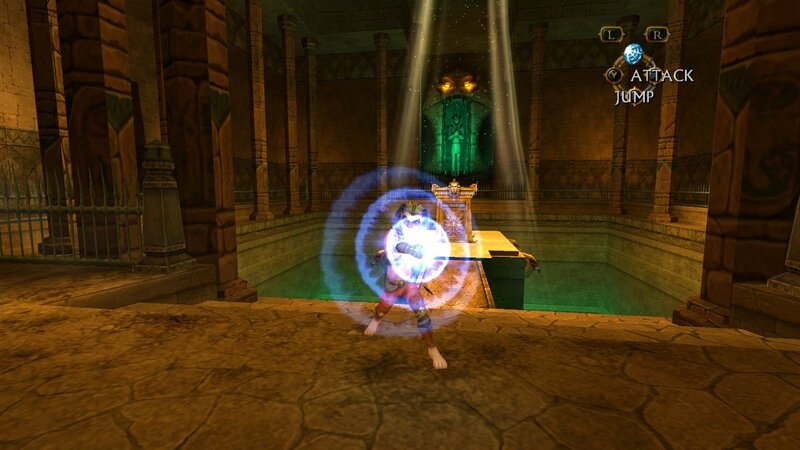 Hope Ubisoft re-release the Prince of Persia games. Out of all the Gamecube games to port over to the Switch, this is what we get? This point alone is enough to make me pass... There is nothing I hate more than this in platforming games. @JayJ It's been in my backlog since circa 2005 when I picked it up cheap, but this game was reasonably well received back then. I'd like to play through it on my GameCube one of these days. @Muddy_4_Ever I played Sphinx and the Cursed Mummy on the Gamecube years ago and for some reason I stopped playing completely and sold it but could never remember why (I usually play games through to completion). I'm guessing it was the lack of save points and I got that frustrated with it I had to stop playing. They really should have fixed that issue for the re-release, would have brought the game if they did. I am quite happy to see some Gamecube era titles come to Switch. This game sounds pretty decent. And that would be great. But I have a lot more games waiting for me that I expect to be more than "pretty decent". I never got around to this one, mostly because it came out at the same time as Beyond Good and Evil and Sands of Time, both of which reviewed better. Still, always meant to play it eventually. Now might be the time. @wratih9 Yes they did fix it in the pc release wich this is likely based on. So was any US buyers from BestBuy able to find this Physical version? I looked and looked it told me none available within 250miles and now it says it has none. So how can that be when there was no purchase options before become sold out when it was never there to be purchased. @SwitchForce I pre-ordered my physical copy from GameStop. I had a feeling it would have a low print run just like Katamari Damacy Reroll and it looks like I was right. Kingdom Hearts 3 has all of my attention right now but I will make sure to play this afterwards. @20wonders same here I got my pre-order from GameStop just incase as well. But BestBuy never had it in inventory and was just baiting buyers. Wow I have this for my GameCube. Never got round to playing it! Haha.